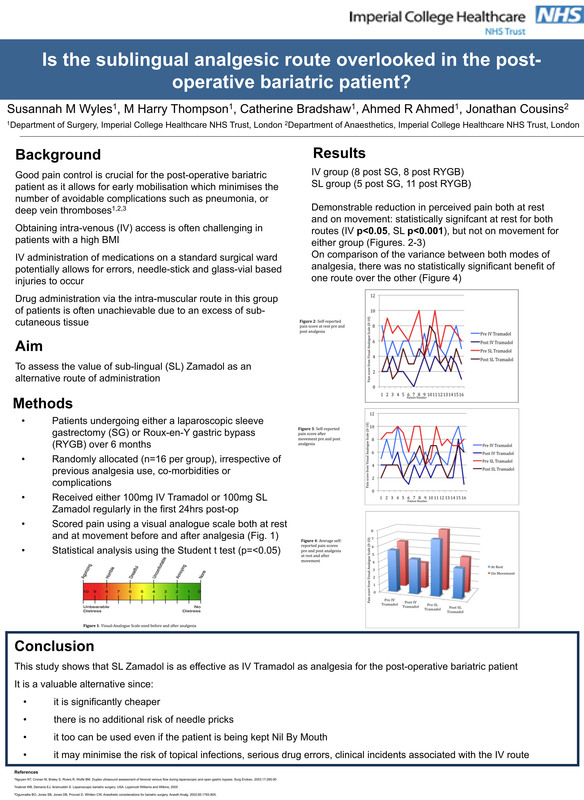 The aim of this study was to assess the value of the sub-lingual (SL) Zamadol as a potentially beneficial alternative route of administration.Good pain control is crucial for the post-operative bariatric patient since early mobilisation is a priority to minimise the number of avoidable complications such as pneumonia or deep vein thromboses. Obtaining Intra-Venous (IV) access is often challenging in these patients, and there are risks associated with administering opiates intravenously on a standard surgical ward not only for the patient, but also for the nursing staff including needlestick and glass-based injury. Drug administration via the intra-muscular route in this group of patients is often not achieved due to an excess of sub-cutaneous tissue. Over a 6 month period bariatric patients who underwent a sleeve gastrectomy or gastric bypass were given either 100mg of Tramadol IV or 100mg Zamadol SL as regular analgesia in the first 24hrs after surgery. They were allocated to the groups at random, irrespective of their previous analgesia usage, comorbidities or complications. They were asked to score their pain using a visual analogue score both at rest and at movement before and after analgesia. These scores were analysed using the Student t test (p=<0.05). Sixteen patients were included in each group (IV group 8 post sleeve, 8 post bypass, S/L group 5 post sleeve, 11 post bypass). There was a demonstrable reduction in perceived pain both at rest and on movement. This was found to be statistically significant at rest for both routes (IV p<0.05, S/L p<0.001), but not on movement for either group. On comparison of the variance between both modes, there was no statistically significant benefit of one route over the other. This study shows that sub-lingual Zamadol is as effective as IV Tramadol as post-operative analgesia for the post-operative bariatric patient. It should be considered as a valuable alternative, as not only is it significantly cheaper and increases patient comfort without additional needle pricks, but also it can be taken without water, and can minimise potential topical infections or serious drug errors and clinical incidents associated with the IV route.